The whitewashed houses, exquisite sandy beaches, large and small bays lying on Cukurbag peninsula, turquoise water of the Mediterranean Sea , picturesque view and almost a stone's throw from the Greek island of Meis ; This is the scene that everyone sees before entering the town of Kas. 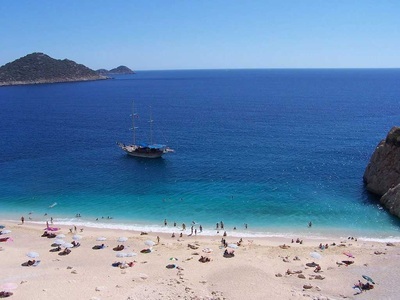 The lovers of Antalya region, Turkish Riviera, prefers spending at least one or days before leaving the region either in Kas or Kalkan hotels as to have summer holiday lying down on the sandy beaches and swimming in clear water of Mediterrenean Sea. Kas is about 190 km far from Antalya city and is surrounded with Fethiye in the west, Demre is in the east and Elmalı in the north. Just oppite of Kas, 2100 meters far way, The Greek Island Meis is located. Kas has a coast of 70 kms in length. There are alot of connections to reach Kas either by land or by sea. It takes about an hour from Fethiye by road and takes two hours from Antalya airport. The small boats from Fethiye carry the visitors to Kas by sea in summer months. 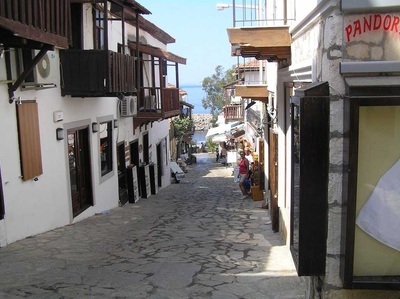 Mediterranean climate prevails in Kas, summers are hot and dry, winters are mild and rainy. Kas is the only center of Turkey which the temperature never falls below zero in winter so tourism is available all the year round. The best time of visiting Kas and having a holiday is October and November. Kas used to known as Antiphellos in antiquity. According to the recent seraches, the town was built as one of the Lycian cities dated back 2200 BC by Luwians migrated from central Asia. In the Egyptian sources, the Luwians were the Hittites and the Lycia was known as the land of light. We understand from an shipwreck in Uluburun near Kas that Lycia used to have an intensive trade relations with Mediterranean countries such as Egypt and other civilizations. When the whole Asia Minor was invaded by Persians in 6th century BC, The lycians had never accepted the occupation. As soon as the Persian troops appeared, The Lycians men set their cities to fire rather than surrender, , killed their own families and then they fought until the last drop of blood but the Persian rule took about three hundred years till the time of Alexander the Great. In 334 BC the Lycain land was taken over by the Alexander without any resistance. After the death of Alexander the Great, The town was taken either Ptolemaic or Seleucid kings, later it was given to Rhodes and finally Roman rule began in 1the 1st C AD. When The Roman emperor Brutus plundered the town in the first century AD, the inhabitants set Antiphellos in fire as they did in Persian period so the town was sucked and destroyed. Augustus, Trajan and Hadrian made a great effort to rebuild the town and Antiphellos had a peak period during Pax Romana. In 141 A.D, All Lycian region was destroyed by a huge earthquake. Thanks to the support and assistance of the rich Roman Empire to rebuild Antiphellos. A hundred year later, another big earthquake hit the whole region again but Roma was weak this time and at the end of 4th C AD , Rome was split into two, and the Lycian region was ruled by Byzantine Empire. During the Arab invasion in 8th and 9th centuries, the town was called as “Andifli “ and the region was later ruled by Seljuk Empire. The name Anatolia by the Turks instead of Asia Minor was seized Beylik of Teke management following the Seljuk Empire's collapse and has added to the Ottoman Empire by Sultan Yildirim Beyazid in 14th C AD. During Ottoman period, Kas was a small settlement of Teke region and the nomads were settled down in tribes to survive thier own living with flock of sheep and goats so the area became an important center for the milky industry. When Turkish republic was founded, the town was added to Antalya city, and tourism industry got developed after 1980s as the Turkish government open the region for both international and domestic investors. There are not many extant ruins that the town was built on Antiphellos of ancient central Lycia region. The walls from the city known as the Acropolis facing the island of Meis can be seen today. 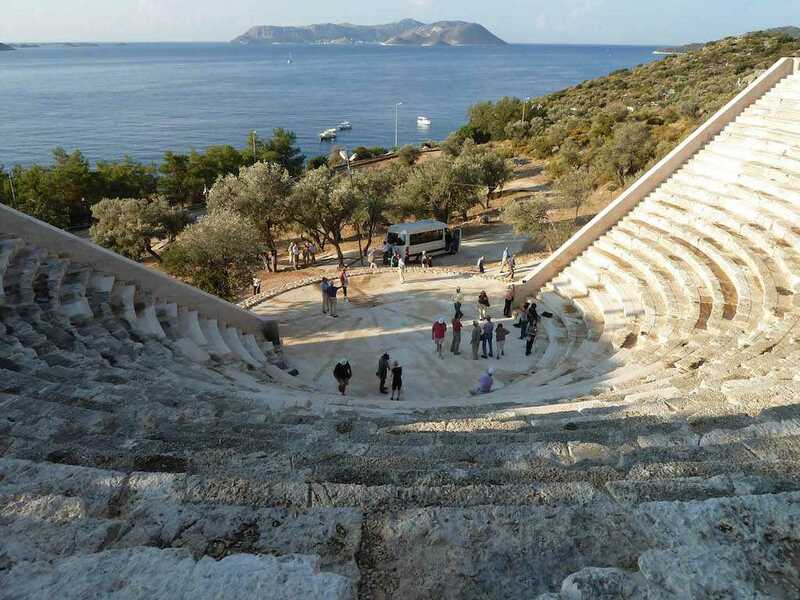 The theatre of Antiphellos overlooking the sea, in the the right side of the road which goes to the western part of the peninsula, is in a very good condition. The most important monument of Kas is a long sarcophagus made of single block which appears in the Market Street. Due to unable to read eight lines of text on the sarcophagus in Lycian language, it is not known to whom they belong . Therefore, people have ascribed to him as the name King Tomb. Kas is a natural paradise with nice and long sandy beaches. In Kas Akçager, small pebbles and large gravel are the distinguished places where you can relax on the beaches with pristine waters. Meanwhile Kaputas Beach is also one of the world’s wonders.There are 6 caves located around Kas and the famous one among them is called the Pigeon Cave about 18 km away from. If you come to Kas, It is not possible to go to Kekova. It is recommended to go by boat from Kas in order to see the great sunken city. Kekova is a rocky island near the small town of Demre. Although the surface area of this island is 4.5 square kms no one is living and to reach to the island boats are used . Kekova and its environment have been declared as the protected area by the Ministry of Environment and Forestry on June 18, 1990. Swimming and diving all around the historical wrecks are subject to special permission from Turkish authorities. 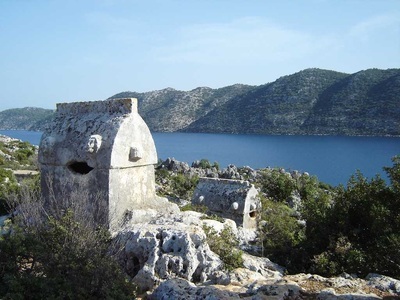 There are also Istla, Apollonia and Kyaenai ancient settlements as well as more unknown ruins around Kas. Kalkan is a small settlement full of boutique hotels, pension houses, cafes and restaurant with sandy beaches which belongs to Kas town and is about 25 kms far from Kas. It is founded on the shores of a bay worth visiting. Restaurants, shopping venues and famous beaches in nice atmosphere , attract millions of tourists every year. 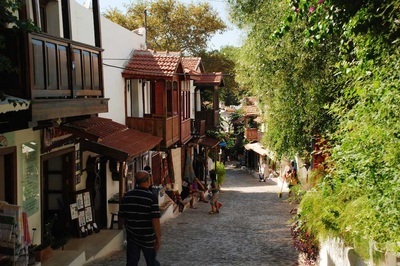 Kalkan is one of the unspoiled vacation centers of the Turkish Riviera and it is preserved carefully both by the inhabitants and the local authorities. Yatch marina is one of the most favorite hangout places for yatch owners. Kalkan used to be known as a tiny Greek fishing village named Kalamaki untill 1920s. The remaning church from the Greek village is used as a mosque today.